Le Cirque Las Vegas celebrated its tenth birthday late last year, and ELV celebrated a birthday (his come with alarming frequency these days), last week. 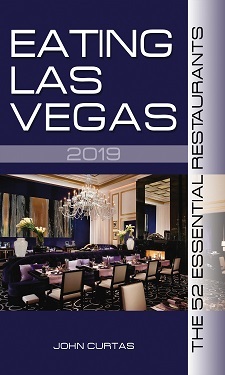 So in honor of both, we decided to partake of Chef David Werley’s superior French cuisine, in what remains one of the prettiest, most romantic and intimate dining rooms in all of Las Vegas. It must rankle the rank and file back in New York that Le Cirque Las Vegas has a Michelin star and their flagship in the Bloomberg Building does not. Truth be told, we’ve eaten in both restaurants a number of times and rarely have found a flaw in the food or service at either of them. Our Le Cirque represents all a great restaurant should be. In size (65 seats) it resembles an intimate European dining salon. In graciousness, it is decidedly old school. As for the food: everything (and we’re not exaggerating) is invariably perfectly cooked. Along with that cooking and the hands-on management style of the Maccionis, another important reason for the success of LCLV is the constancy of the staff. There have been a few different General Managers since it opened (most notably Dominique Bertolone — now Director of Restaurants for the Bellagio), but the waitstaff is chock full of folks who’ve been there since it opened its doors in 1998, and returning customers are always greeted by a sea of familiar faces. How many ten year old restaurants in America can you say that about? In a nod to the Maccioni youth movement and the ambitions of its chef, the menu is divided into “classic” and “contemporary” sections. Traditionalists, like….uh…er…yours truly can’t fault warhorses like sauteed foie gras, Burgundy snails, “Blanquette” de lapin or a textbook-perfect sole “Meuniere,” but neither can we criticize Werley’s turbot with braised parsnips, macadamia nuts and caviar, or venison “Grand Veneur” — each an impeccable exhibition of its main ingredient. As you can see from the tasty snaps above, we were in an old-school mood for our little celebration, and from the Beausoleil oysters with caviar and the spotted prawn with potato/truffle foam amuse that began the meal, to the creme brulee that ended it, every bite and sip was a seamless expression of what a first class restaurant meal should be. The first five or six times ELV ate in the New York and Las Vegas Le Cirque(s) he paid with his own money (lots of it). The last several times he has dined in either, the Maccionis have graciously declined to present him with a bill. That being said, a three course prix fixe (with an amuse bouche here and an amuse gueule there) is $98/per — so with a modest bottle of wine, tax and tip, a meal for two will run around $300) — a relative bargain compared to some other tariffs in town. This Just In….Next To Vegas, New York City Is A Bargain! Yes, it’s an interesting time to pay tribute to the older elegant establishments on the Strip that are still doing it very right. I’m still sorting out the fact that this wonderful French restaurant is owned by an Italian family. Mind you, I enjoyed my dinner at Le Cirque very much. Grazie … or is it “Merci”? Thank you, anyways. Happy Birthday ELV! Good food, good wine, good company what could be better? Here’s to another year. Cheers.